Physician burnout and the physician shortage have been big news in healthcare for several years — and both are concerning issues that need to be addressed. However, there are still an abundance of positives around the practice of medicine and many physicians are very happy with their jobs and lives. To find out more about physician happiness, CompHealth and the American Academy of Family Physicians partnered on a survey to take a deep dive into what makes physicians happy. These organizations surveyed members of the AAFP as well as physicians from many other specialties throughout the country. More than 5,000 physicians shared their thoughts about happiness and satisfaction with life. The survey found the majority of physicians currently in practice (71 percent) are happy and 57 percent report enjoying their life “a lot” or “a great deal.” Fifty-nine percent also reported being satisfied with their lives, with older physicians (more than 30 years in practice) showing the most satisfaction. In addition, 61 percent indicated if they had it to do over again, they would still become physicians. An interest in the science of medicine is what brought most physicians into the field, but what keep them happiest with their jobs are the personal relationships they have with family, friends, and patients. Having friends at work also greatly impacted physicians’ happiness. There was a direct correlation between the number of friends a physician had at work and their satisfaction with their lives. Physicians who indicated having “many” friends at work also indicated high life satisfaction (70 percent). Of the physicians who reporting have no friends, only 39 percent had high satisfaction. Similar findings were found when asking physicians how supportive their colleagues were. Those with many friends felt their colleagues were supportive (69 percent), while only 29 percent of those with no friends felt supported. All physicians overwhelmingly reported having positive relationships with patients (88 percent), other physicians (84 percent) and staff (87 percent). However, only 50 percent of physicians indicated a positive relationship with administrators. Physicians’ relationships with mentors were also important. Fifty-two percent felt mentors were important to their careers and 73 percent had served as mentors to others. 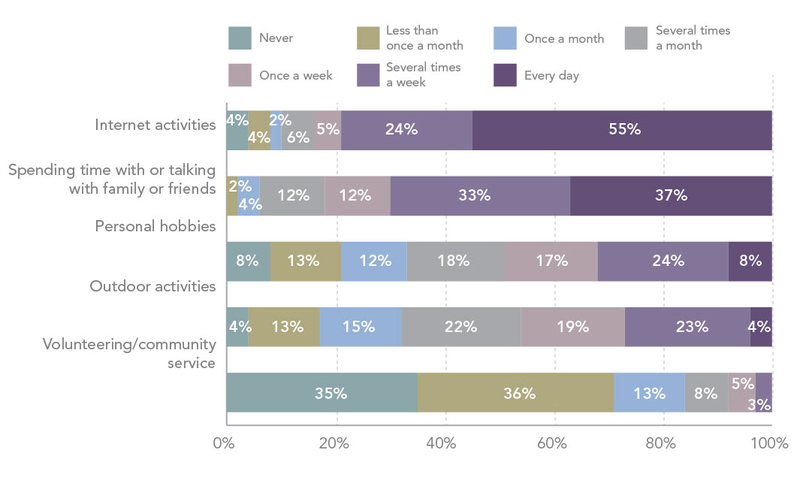 When away from work, physicians most frequently spend time on the Internet or with family and friends. Physicians also spend a lot of time exercising, with 62 percent exercising once a week and 41 percent exercising several times a week. While physicians are generally happy, there are a variety of aspects of their jobs that make them unhappy. The top issues are lack of control (72 percent), clerical burdens (71 percent), and being emotionally exhausted (69 percent). In addition, the survey also identified specific tasks that hindered their happiness at work. The two top responses were clerical duties and administrative issues (both at 28 percent). Other issues were time constraints and lack of staff support. Insufficient pay was lowest on the list for hindering happiness. Lack of time with patients may be another contributing factor for physician unhappiness, as 55 percent of physicians reported time available for individual patients has declined since they started practice. However, 44 percent reported that quality of patient care had improved since they began practice. The practice of medicine is inherently stressful. The survey found that only 35 percent of physicians have more happiness than stress in their lives while 43 percent reported having more stress than happiness. Stress manifests itself in different ways, but the greatest number of physicians (81 percent percent) reported feeling stressed when they didn’t have enough time. 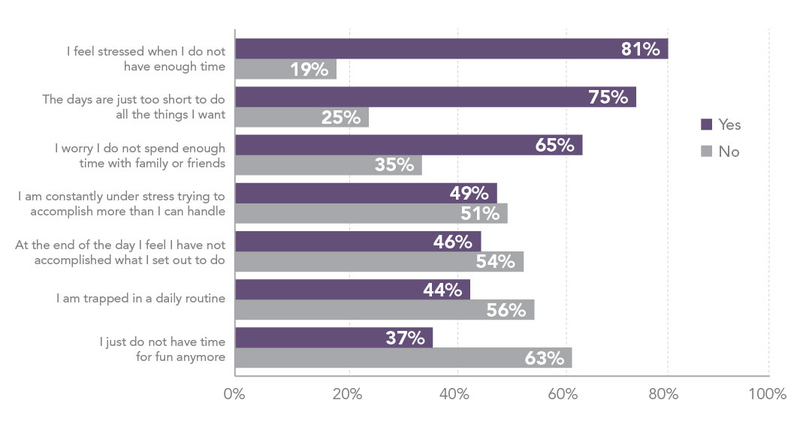 However, even when faced with stress, 63 percent said they still have time for fun. Physicians also deal with stress in different ways. Most (76 percent) utilize downtime, 73 percent spend time with family and friends, and 63 percent take time off. Autonomy and control were extremely important to physicians but very few had complete control over their work. Only 13 percent had full control over their work. The largest group (43 percent) reporting having some input in their work rather than full control. A lack of control or autonomy, however, did not impact physicians’ ability to do their jobs. The majority (68 percent) of physicians reported they are able to perform their jobs efficiently and have all the resources they need. Only 31 percent of physicians felt their organizations prioritized physician well-being. Few physicians (34 percent) feel appreciated for their work. Physicians are most commonly recognized by patients and peers, but 29% had never been formally recognized. When looking at happiness, the role of gender is mixed. For example, women rank higher than men for having more stress than happiness (46 percent vs. 39 percent). However, women also reported spending more time with patients (53 percent vs. 46 percent) and less time at work (53 percent spend 10-14 hours a day at work compared to 58 percent). Women also find working with patients more gratifying than men (90 percent vs. 86 percent) and less gratification in money (47 percent vs. 55 percent). The majority of physicians (71 percent) currently in practice are happy; however, 19 percent report they are very or somewhat unhappy. Fifty-seven percent of physicians report enjoying life “a lot” or “a great deal.” Only 1 percent say not at all. Physicians are also largely satisfied with their lives, with 59 percent stating they agree or strongly agree with the statement “I am satisfied with my life,” compared to just 10 percent who disagree or strongly disagree. 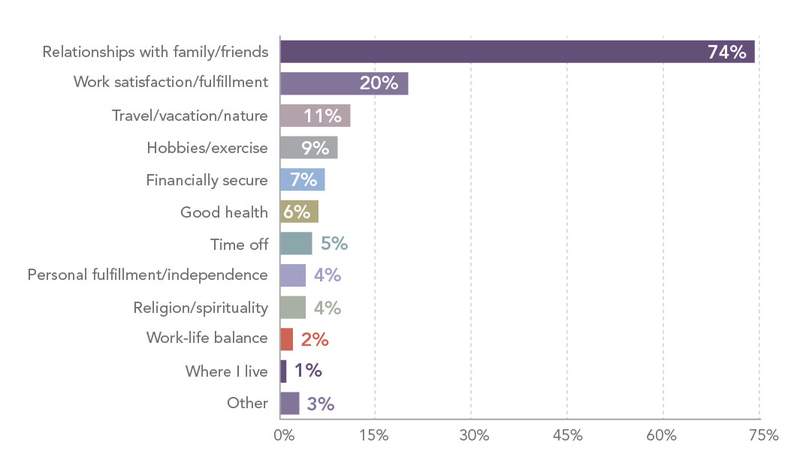 Physicians are also largely satisfied with their relationships, health, careers, and finances. Physicians find high satisfaction in life early in their career (62 percent). Life satisfaction drops to 53-55 percent for physicians who have worked between six and 30 years. Satisfaction then jumps up to 68 percent for physicians with more than 30 years of practice. Satisfaction also varies by specialty, with urgent care reporting the most satisfaction (67 percent) and primary care and OB/GYN reporting the least (56 percent). Most physicians (61 percent) would still become a physician if they had the chance to live their life again. The reasons that physicians went into medicine varies but the top choice was an interest and enjoyment in the science of medicine (75 percent) followed by being of service (63 percent). Physicians may have gone into medicine for their love of science and service, but what currently brings them happiness in their jobs is overwhelmingly the relationships they have with family and friends, and what they find most gratifying is helping patients. What is the most gratifying part of being a physician? Physicians also reported that interpersonal relationships, more than any other aspect of their job, contributes to their happiness. What contributes to physician happiness? Happiness at work and home are greatly influenced by each other; 58 percent of physicians indicated their life outside of work impacts their happiness at work and 56 percent find their happiness at home is impacted by their work. With interpersonal relationships being key to a physician’s happiness, it’s not surprising that friends and mentors at work play a role as well. Most physicians reported having at least a few friends at work (84 percent), with 19 percent reporting they had many friends. Physicians with friends at work are also happier and report more satisfaction with their lives. Seventy percent of physicians who reported having many friends at work were satisfied with their lives. Only 39 percent of physicians who had no friends at work reported being satisfied with their lives. Having friends at work is also affected by a physician’s specialty. Urgent care physicians were least likely to have some or many friends (37 percent), possibly due to the fast-paced nature of the environment. Hospitalists reported having the most friends (61 percent), likely due to working in a hospital environment where they interact with more people. Having friends at work also impacts how supportive physicians consider their colleagues to be. Generally, 45 percent of physicians reported their colleagues as being very or extremely supportive. However, 69 percent of physicians with many friends at work reported their colleagues were very or extremely supportive. Only 23 percent of physicians with no friends at work reported having very or extremely supportive colleagues. How supportive are your colleagues in the workplace? How supportive are your colleagues in the workplace based on number of friends? When expanded to look at positive relationships with others beyond immediate colleagues, physicians largely have very positive relationships with patients (88 percent), ancillary staff such as nurses, EMTs, etc. (87 percent), and other physicians (84 percent). However, only 50 percent of physicians indicated a positive relationship with administrators. How positive are physician relationships with the following? Mentorship also plays a positive role in physicians’ lives, with 52 percent feeling that mentors have been very or extremely important in their careers. 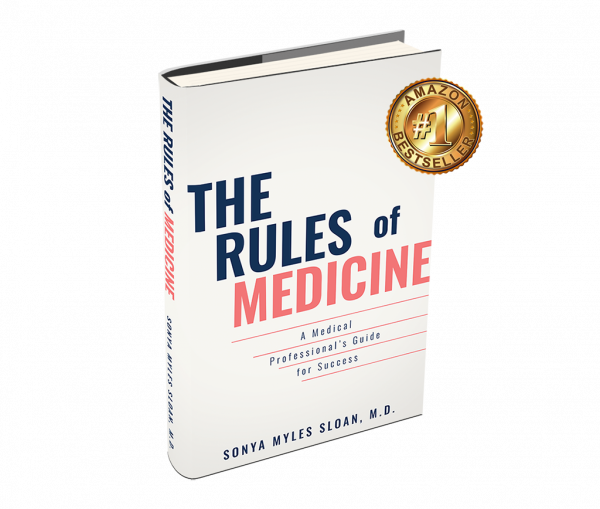 Seventy-three percent of physicians have also served as either formal or informal mentors. How important are mentors to your career? Have you ever been a mentor to colleagues in the workplace? 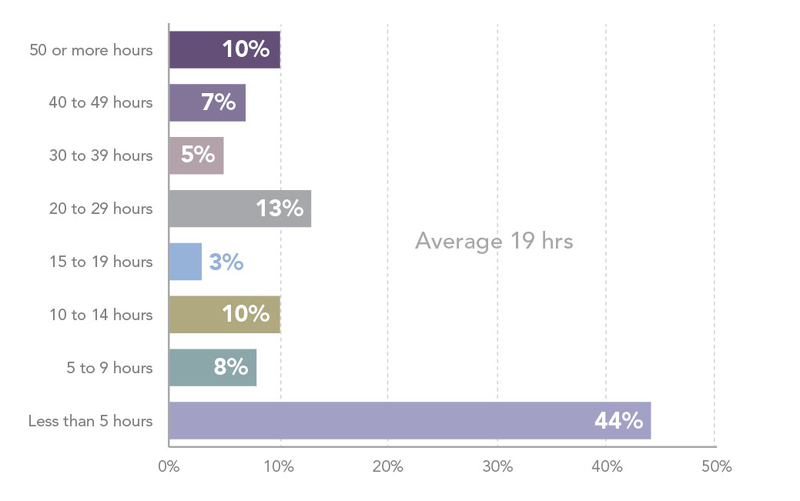 Outside of work, physicians most frequently spend their time on the Internet or with family and friends. Sixty-two percent of physicians exercise at least one day a week, with 41 percent exercising several times a week. In addition to the above activities, religion or spiritualism are important to some physicians. Twenty-five percent of physicians practice mindfulness or meditation. Do you practice mindfulness or meditation? Physicians have grown happier since their time in med school and residency, although they never get back to their pre-med school happiness levels. While physicians generally may be happy, there are a variety of aspects of their jobs that make them unhappy. The top issues are lack of control (72 percent), clerical burdens (71 percent), and being emotionally exhausted (69 percent). In addition to the reasons for unhappiness in their jobs, the survey asked what physicians felt hindered their happiness at work. The two top responses were clerical duties and administrative issues (both at 28 percent). Other issues were time constraints and lack of staff support. Insufficient pay was lowest on the list for hindering happiness. What hinders physicians’ happiness at work? Lack of time with patients may be another contributing factor for physician unhappiness, as 55 percent of physicians reported time with patients has decreased since they started practice. However, 44 percent reported that quality of patient care had improved since they began practice. Feelings about EMRs and work/life balance stayed roughly the same but communication between medical staff was reported as being better by 40 percent of physicians. Since beginning practice how have the following changed? Working as a physician is inherently stressful. Only 35 percent of physicians reported having more happiness than stress in their lives, while 43 percent reported having more stress than happiness. Physicians feel stress in a variety of ways. Eighty-one percent reported feeling stressed when they didn’t have enough time but 63 percent said they still have time for fun. Physicians also cope with stress in different ways. The top de-stressing activities were downtime (76 percent), spending time with family and friends (73 percent), and taking time off (62 percent). Less than one percent reported not having any stress. Autonomy and control were extremely important to physicians but very few had complete control over their work. Only 13 percent had full control over their work. The largest group (43 percent) reported having some input in their work rather than full control. A lack of control or autonomy, however, did not impact physicians’ ability to do their jobs. The majority of physicians reported that they are able to perform their jobs efficiently and that they have all the resources they need. At the same time less than a third of physicians (31 percent) felt their organizations prioritized physician well-being. Few physicians (34 percent) feel appreciated for their work. Physicians are most commonly recognized by patients and peers. Twenty-nine percent had never been formally recognized. When looking at practice type, locum tenens physicians reported feeling the most appreciated (41 percent) while hospital-based physicians reported the least appreciation (30 percent). When looking at happiness, gender plays a large role in some areas and no role in others. For example, women rank higher than men for having more stress than happiness (46 percent vs. 39 percent); thinking the days are too short to accomplish everything (80 percent vs. 70 percent); getting to the end of the day and haven’t accomplished what they set out to (51 percent vs. 41 percent); and trying to accomplish more than they can handle (56 percent vs. 46 percent). Women also reported spending more time with patients (53 percent vs. 46 percent) and less time at work (53 percent spend 10-14 hours a day at work compared to 58 percent). Women also spend less time on call, working an average of 17.31 hours per week compared to 20.42 hours per week. Women also find working with patients more gratifying than men (90 percent vs. 86 percent) and less gratification in money (47 percent vs. 55 percent). Women are more likely to be emotionally exhausted (74 percent vs. 63 percent), physically exhausted (64 percent vs. 50 percent), and have an excessive workload (69 percent vs. 58 percent). Women are more likely to work in primary care and OB/GYN. Men are more likely to work in emergency medicine, hospital medicine, and surgery. The AAFP and CompHealth partnered to administer a survey to 5,855 physicians. The survey was taken by both members of AAFP as well as physicians working in a wide variety of other specialties in states around the country. The goal of this study was to look at physician happiness in the workplace and determine what made physicians happier in their jobs. For some questions “not applicable” was selected, these data points were not shown, so some data sets may not add up to 100 percent. Family physicians conduct approximately one in five of the total medical office visits in the United States per year – more than any other specialty. Family physicians provide comprehensive, evidence-based, and cost-effective care dedicated to improving the health of patients, families, and communities. Family medicine’s cornerstone is an ongoing and personal patient-physician relationship where the family physician serves as the hub of each patient’s integrated care team. More Americans depend on family physicians than on any other medical specialty. To learn more about the AAFP and family medicine, visit www.aafp.org/media. Follow us on Twitter, and like us on Facebook. For information about health care, health conditions, and wellness, visit the AAFP’s award-winning consumer website, www.familydoctor.org. CompHealth is a national leader in healthcare staffing, serving providers in more than 100 specialties. CompHealth was founded in 1979 and is now the largest locum tenens staffing agency in the U.S. The company also specializes in permanent physician placement and both temporary and permanent allied healthcare staffing. CompHealth is part of the CHG Healthcare family of companies, which has been listed on FORTUNE magazine’s list of “100 Best Companies to Work For” for the past 10 years. Chad Saley is a public relations manager at CHG Healthcare, the parent company of CompHealth. Unfortunately, I find the title of this article, very misleading at best and falsely equates the burning-process (and it’s consequences) as the opposite of “happiness”. The real question (point) which is not addressed at all is, if MDs are so happy, why are physicians burning-out. The interpretation of the data is truly missing the obvious. Happiness is not the opposite of burn-out, but engagement, empowerment, and being connected with our altruistic purpose are the opposite of the burning-out process. I would even postulate that “happiness” is too much of a subjective threshold and avoids those issues (80% systemic/organizational & 20% self) which actually are causing the burning-out process. The biggest result of trying to “down-play” the real burning-out process that is affecting the medical care team work force and patient care, is that it allows the process to continue. There is definitely a cognitive dissonance present (if I am “happy” than I can’t be burning out). Or, worse, the systems/organization saying, if our staff are happy then we don’t have to acknowledge or recognize our responsibility in the burning-out process. If the data shown in this study was analyzed fully, it would show that those factors which affect physicians practice are exactly those which have a strong correlation with the research on the burning-out process. Again, it is right in full view as you go through the data. “Happy” physicians do burn-out and that is what is not addressed. Being “happy” and burning-out are mutually exclusive. Putting a mask on, covering-up the burning-out proves by focusing on a subjective term of happiness, will and does have a determental affect on ALL health (Patient, physician and yes, the organization). Thank you for taking the time to delve into the study. We agree with you, burnout is a serious topic and there have been many studies highlighting all of the issues that go along with it. We wanted to focus on another topic. The purpose of this study wasn’t to look at burnout or compare burnout to happiness. It was designed to find out what makes physicians happy about their jobs. Thanks again for your thoughtful comment.